Cats love to run and play almost as much as they like sleeping and eating. There are plenty of mouse toys or jingling balls you can buy for your cat. 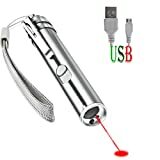 Perhaps you want to try something new and more exciting, such as a laser pointer. 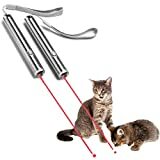 Finding the best laser pointer for cats will provide entertainment for both you and your feline friend! Let’s take a look at the benefits of a toy like this and how to decide which one to buy! Increases physical activity: Some cats like to lounge around all day, which is normal for their species. It’s important for cats to get exercise too though. They need to run around and play. It’s also necessary for cats to stay active to prevent obesity. A laser pointer is a great way to do this! Playtime options: Your cat only wants to play with the same catnip-filled mouse for so many days. They do need to play, as mentioned before. Giving your cat new and exciting games to play can help prevent them from getting bored. With pointers, you can point them anywhere. This will keep your cat engaged in playtime. Positive connection: Playtime is one way that cats can bond with their owners. Keeping the playtime connection positive can greatly benefit a cat’s overall health—and their relationship with you! Uses their instincts: Prior to cats’ domestication, they were hunters. Even to this day, some cats prey on mice. Kitties need to be given opportunities to “hunt”, even if they live indoors. Playtime is a good way to do this, especially since many toys and games will encourage cats to “attack the prey”. 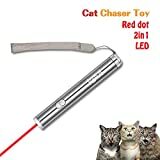 With a laser pointer, the red dot works as prey for your cat to stalk. Battery life: Most laser pointers require batteries. Some are rechargeable. Which one you choose should depend on your own preferences! Safety: Make sure that the laser pointer you buy is safe for animal use. If this isn’t mentioned in an item description or on the packaging, you may choose to look elsewhere. The range should be 1 to 5 milliwatts. Versatility: Some laser pointers come with multiple light options. These might include a red laser and a green laser. Others have LED lights and UV lights. Again, this depends on what you are looking for. 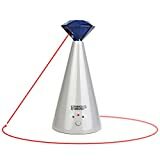 A few laser pointers even have feathers attached to the end for added playtime stimulation! As you can see, there are many good reasons to buy a laser pointer for your cat. They keep playtime interesting and provide health benefits for your cat as well. Be sure to do your research. 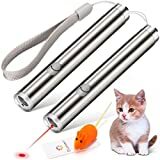 Look for a laser pointer that has good battery life and is safe to use with animals. This will quickly become one of your favorite ways to play with your feline friend!